Spaceflight participant Guy Laliberte is pictured in the Unity node of the International Space Station Oct. 5. This story was updated at 12:32 a.m. EDT. The first clown in space landed safely on Earth earlySunday, capping off a mission to spread awareness about water conservation. 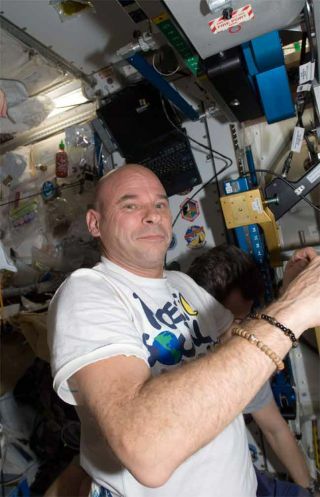 Guy Laliberte, a Canadianbillionaire and founder of the circus troupe Cirque du Soleil, touched downon the steppes of Kazakhstan at 12:32 a.m. EDT (1632 GMT) after an 11-day spacejaunt. He rode in a Russian Soyuz spacecraft along with two professionalspaceflyers returning from six-month stays aboard the International SpaceStation. The trio closed the hatches between their Soyuz TMA-14 andthe orbiting laboratory at 6:06 p.m. EDT (2206 GMT) and undocked at 9:07 p.m.EDT (0107 GMT Sunday), after saying farewell to their crewmates still onboardthe station. "Goodbye station," saiddeparting Expedition 20 commander Gennady Padalka, a Russian cosmonaut. Laliberte wore his trademark red clown nose as he hugged thestation residents goodbye. "I would like to express my gratefulness to all mycrewmates," Padalka said during a change-of-command ceremony before heleft the station. "Without my crewmates I would be nothing ascommander." Rookie spaceflyer Mike Barratt is also making the trip home. "For a first flight I'm probably one of the luckiestastronauts," Barratt said. "My first flight was incredible." Laliberte called his trip the "Poetic Social Mission"and dedicated himself to advocating for water. The issue is close to his heart- he founded the non-profit ONE DROP Foundation to combat world poverty throughglobal access to clean water. Laliberte's mission culminatedin a performance he hosted Friday night from space, in which artists in 14cities around the world used acrobatics, dance, song and poetry to celebratewater. Co-performers included former United States Vice President Al Gore,actor Matthew McConaughey, singers Peter Gabriel, Shakira and Joss Stone, actressSalma Hayek, and the band U2. Cirque du Soleil members performed an acrobatic routine inMontreal, Canada and Las Vegas, and in South Africa the a cappella choral groupLadysmith Black Mambazo sang. Rappers performed in Marrakech, Morocco, and inNew York, people in the middle of Times Square appeared to spontaneously joinin a choreographed dance. "I am an artist, not a scientist and that is the onlyway I can make a significant contribution to a mission," Laliberte saidduring the event. "I decided to use this privilege to raise awareness forthe water issue." Laliberte paid more than $35 million to the Russian FederalSpace Agency (through the U.S. firm Space Adventures) for the trip, but saidthe experience was worthevery penny. "What I've been experiencing here has been an amazingjourney," he said. "This was a moment to create awareness toward thesituation of water in the world. I don?t have 25 years, the world don?t have 25years to address the situation of water. I think this was a great opportunityto combine to a personal dream also." Padalka and Barrat are completing a long-duration tour ofduty on the orbiting laboratory, where Padalka served as commander of theExpedition 20 mission. On Friday he handed control of the station over toEuropean Space Agency astronaut FrankDe Winne of Belgium, who became the first European station commander. "Our mission was very, very long and very productive,and I would say very eventful," Padalka said Tuesday via radio link fromthe station. "Right now we are ready to go home, and I hope that the spacestation will be left in a great position for the next commander and the nextcrew." Barratt, a first-time spaceflyer, was an Expedition 20flight engineer. Waiting for him at home are his wife and five children. "I have a big family and that?s the strongest magnet onthe planet," Barratt said Monday. "I need to get home to them. But atthe same time I'm going to be truly sad to leave this place. This crew up herehas become a second family." Barratt won't have much time to rest once he gets home.While in space, he was assigned to fly on the lastscheduled space shuttle mission, the STS-133 flight of Discovery slated forSeptember 2010. He plans to begin training for that mission soon afterreturning to Earth. "It's been a long time since I've trained on shuttle soas soon as I land, I'm going to hit the books," Barratt said. Padalka and Barratt were part of the space station'sfirst-ever six-person crew, doubled from the previous teams of three. "The main goal of our mission was six-personcrew," Padalka said. The expanded population helps keep the stationrunning smoothly and allows astronauts to take on more science research work. SPACE.com is providing full coverage Laliberte's fightand the Expedition 20 landing with Staff Writer Clara Moskowitz in New York. Click here for mission updates and livemission coverage.